MySQL is a popular and robust open source database product that supports key subsets of SQL on both Linux and Unix systems. MySQL is free for nonprofit use and costs a small amount for commercial use. Unlike commercial databases, MySQL is affordable and easy to use. This book includes introductions to SQL and to relational database theory. If you plan to use MySQL to build web sites or other Linux or Unix applications, this book teaches you to do that, and it will remain useful as a reference once you understand the basics. Ample tutorial material and examples are included throughout. This book has all you need to take full advantage of this powerful database management system. It takes you through the whole process from installation and configuration to programming interfaces and database administration. This second edition has a greatly enhanced administration chapter that includes information on administrative tools, server configuration, server startup and shutdown, log file management, database backup and restore, and database administration and repair. In addition, a new chapter on security describes data, server, and client-server security, while a chapter on extending MySQL provides an overview of MySQL internals and describes the use of MySQL user-defined functions. If you know C/C++, Java, Perl, PHP, or Python, you can write programs to interact with your MySQL database. In addition, you can embed queries and updates directly in an HTML file so that a web page becomes its own interface to the database. 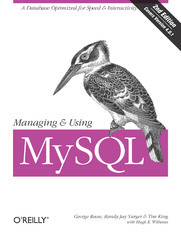 Managing and Using MySQL includes chapters on the programming language interfaces, and it also includes a complete reference section with specific function calls for each language. Also included in the reference section are references to the SQL language, and details of the MySQL system variables, programs, and utilities. New to the second edition is a reference to the internal MySQL tables, which will be of particular interest to those who want to work extensively with MySQL security.